Saturday morning the doorbell rang. When this happens, it’s usually someone soliciting something, your vote, your money, your beliefs. This morning was different. I open the door and in walks our four-year old next door neighbor. “We lost our ball,” he announces and strides past me towards the backyard. His tow-headed three-year-old brother is close behind. I follow noticing their lack of shoes. We pass my husband and walk out the sliding glass door. The sock-footed brothers venture ahead onto the pea gravel path that surrounds our house. They seem to know where they’re going. “It’s a blue ball,” brother number one says. We look. Nothing. Soon my husband joins in the hunt. “You sure you hit it over here?” I ask. “Yes,” says brother number one. “It hit here,” he says pointing towards the trellis. We all follow his directions and look carefully around the base. No blue ball. Brother number two looks at me. “Can I see your cat?” Clearly the next line of inquiry. No ball, how about that cat. The doorbell rings. We, brother number two and I, open the door and there stands Dad. I tell Dad we have not found the blue ball. We all go outside looking for brother number one, my husband and the blue ball. No blue ball but brother number one and my husband are up on the hillside climbing around. “Didn’t you guys lose that ball a few days ago,” says Dad. 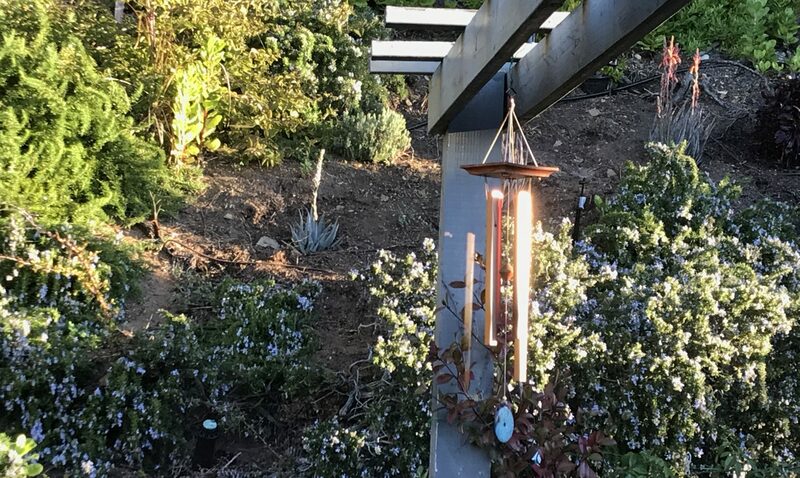 “I threw some balls over the fence a few days back,” says my husband. Suddenly brother number two looks up and says, “Daddy, can you hold me.” Apparently the hunt is over. The three leave for home without their blue ball. I’d forgotten this age, the tiny feet, and voices. I’d forgotten the earnest faces and pure joy blue balls, cats, and climbing hillsides. I’d forgotten how powerful it is to pick a person up when they need it and carry them home. Who knows what got the boys to venture into our backyard. I don’t think it was because they just hit the ball over the fence. Did they just remember it? Whatever the reason, those two brought back sweet reminders of tending to little ones as they grow. 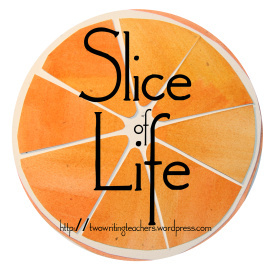 Seek out more slices of life here at Two Writing Teachers. You are a wonderful storyteller. I feel like your story is going to live with me for a while. Those 2 boys are going to live with me for a while. Your husband and your response to the boys too. I also see this as a great mentor text example of “show not tell”. Thanks for sharing your small moment. Love the story of two little boys and their quest, Julieanne. You’ve taken a small part of your life and made it big! Thanks for reminding that little things can mean a lot. The minds and actions of three and four year olds so perfectly described here. I loved the moment by moment action and the true voices of the kids. What a sweet bit of life that reminded you of a past period of life. Now you have a mystery of the blue ball. Such a sweet visit. I love how you painted the whole scene for us. I wished to see and stroke your cat too, and help with looking for the ball. I love this slice of your life. I miss those little ones, too. I find myself drawn to them at stores and church. A conversation with a wee one is always full of adventure. I love the tender way you recreated this moment, Julieanne. This piece reminds me to hold fast to these moments of Isabelle being small since her sense of wonder and amazement about little things won’t be here forever, will it? What a wonderful slice, Julieanne! I can see those two little boys with their “earnest faces” in search of their ball. Thanks so much for sharing! I, too, had forgotten. But your beautiful recounting of a morning visit from the brothers and their dad brought the delight of those days back with sunshine. Thank you for lifting us all with this poignant story.